“Life is a Highway” by Tom Cochrane is the song that comes to mind from recent news out of California. The west coast state has always been at the forefront of “green” transportation initiatives, leading the US in emissions-control standards, for example. Now California is the first state to “electrify” a section of highway between the ports of Los Angeles and Long Beach. 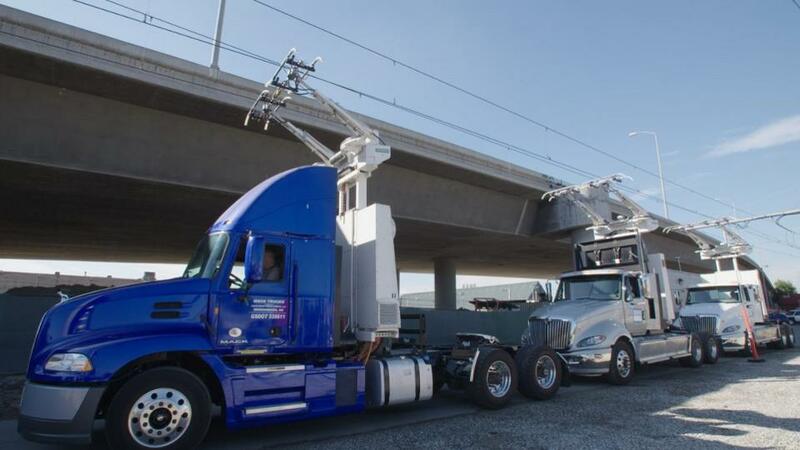 Designed by Siemens, the highway system for trucks moving between the two ports, uses overhead wires like trolley buses or street cars, to power the specially built trucks’ batteries. A version of the technology is already being used in Sweden, where Siemens is based. A test section of the “dynamic-charging road” has been built on a one-mile stretch. The idea is to promote electric trucks to reduce smog in a part of Southern California that gets a lot of truck traffic. “This demonstration could lead to the deployment of eHighway systems that will reduce pollution and benefit public health for residents living near the ports,” said Wayne Nastri, South Coast Air Quality Management District (SCAQMD) executive officer, quoted in Forbes. Learn more about the California e-highway here.